Nestling at the foothills of the Nilgiris, the Bandipur National Park was formed by extending the Venugopal Wildlife Park which was set up in 1931 by the Mysore Maharajas. The Moyer River forms a natural boundary between the Mudumalai Wildlife Sanctuary in Tamil Nadu and the Bandipur National Park in Karnataka. The Bandipur National Park is one of the fifteen Tiger Reserves in the country, launched under the Project Tiger Scheme during 1973. Forest Types : (1) Southern Tropical Moist-mixed deciduous Forests. (2) Southern Tropical Dry Deciduous Forests. (3) Scrub Forests. Fauna : Animals: Tiger, Elephant, Gaur, Leopard, Chital, Sambar, Sloth Bear, Barking- Deer, Wild Boar, Wild Dog, Jackal, Mouse-Deer, Four-Horned Antelope, Langur, Porcupine, Otter, Pangolin, Malabar Squirrel, Civer Cat, Jungle Cat and Macaque. Birds: Pea Fowl, Gray Jungle Fowl, Partridge, Quail, Paradise Fly Catcher, Hornbill, Wood Pecker, Ibis, Stork, Sun Bird, Flower Pecket, Thrush, Crested Hawk Eagle, Serpent Eagle, Drango, Cuckoo, Oriole, Minivet, Wagtail, Myna, Blue Jay & King Fisher. Reptiles: Crocodile, Tortoise, Python, Cobra, Krait, Viper, Rat, Land Monitor, Lizard, etc. 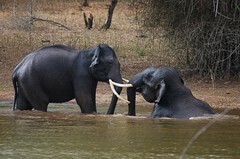 Mudumalai Wildlife Sanctuary (19 Km. ): Adjoining the Bandipur National Park, the Mudumalai Wildlife Sanctuary has a variety of fauna, and different species of birds. Gopalaswamy Hills (20 Km. ): Located at an altitude of 1456.5 metres, it is one of the most beautiful spots in the Bandipur National Park. Ootacamund or Ooty (79 Km. ): Ooty, popularly known as 'Queen of Hill Stations', is situated at an altitude of 7509 feet amidst the Nilgiri Hills of Tamil Nadu. Mysore (80 Km. ): The erstwhile capital of the Wodeyar Kings, Mysore reflects the lavish ways of the Maharajas in its numerous palaces, parks and boulevards in the city. Area : 874 Sq.km. Altitude : 780 to 1454.5 metres. Temperature : Max: 29 Deg.C. Min: 17 Deg.C. Road : Bandipur is connected by motorable roads with Bangalore 220 km., Coimbatore 168 km., Mudumalai Wildlife Sanctuary 19 km., Mysore 80 km. and Ooty 79 km. The Forest Department in the park arranges for wildlife viewing by jeeps or vans. Forest guides accompany visitors on the trip. Timings of Trips : 0600 to 0700 hrs., 0700 to 0800 hrs., 0800 to 0900 hrs., 1600 to 1700 hrs. & 1700 to 1800 hrs. Elephants can also be hired for rides around the Park. Resvns:The Field Director, Project Tiger, Aranya Bhawan, Ashokapuram, Mysore - 570008. Tel: (0821) 480901 (OR) Assistant Conservator, Bandipur National Park, Bandipur-571318. Tel: 636021. Visiting Hours at the Park : 0600 to 0900 hrs. & 1600 to 1800 hrs. Visitors vehicles are permitted in the park only when accompanied by guides of the Forest Department on payment of prescribed fees. (1) Gajendra VIP Suites- I & II, Tariff : Rs.1000/- per suite per day (2) Gajendra III & IV, Mayura Cottages, Papiha Cottages and Kokila Cottages, Tariff : Rs.300/- per suite per day (3) Harini Suites I & II, Chital Suites I & II, Vanashree Suites I & II , Vanaranjani Cottage. Tariff: Rs.150/- per suite per day. (4) Dormitory : Tariff : 20 bedded : Rs.700/-; 10 bedded : Rs.400/-; 6 bedded : Rs.250/-. (Double Rates for foreigners). Resvns:The Manager, KSTDC,10/4, Kasturba Road, Bangalore ,Tel: (080) 3341993. Bush Betta Resort, Bandipur, Tel: 0821-636035. Bangalore Contact Tel: 080-4125220, 2243273. Tariff: Rs. 1990/- per person with full board on twin sharing basis. 1. Information Centre, Bandipur National Park, Bandipur - 571318. Tel : 636021. 2. The Field Director, Project Tiger, Vanasree, Government Sandalkoti premises, Asokapuram, Mysore - 570008. Tel : 480901. 3. The Chief Wildlife Warden, Aranya Bhavan, 18th Cross, Malleswaram, Bangalore 560003. Tel: 3341993.